In 2009 I completed my public art project, Propulsion, a 20 ft. diameter mosaic, executed in handset, smalti glass tiles and permanently installed at Hartsfield-Jackson Atlanta International Airport, Concourse B. My intention was to give viewers a lyrical sense of harmony and equilibrium in motion as they traverse the concourse center point. The design is inspired by the modern turbo fan jet engine, with a nod to classical ancient mosaics. I use large geometric arcs to evoke the uplift of flight and smaller circles of rich modulated colors that merge into the design. 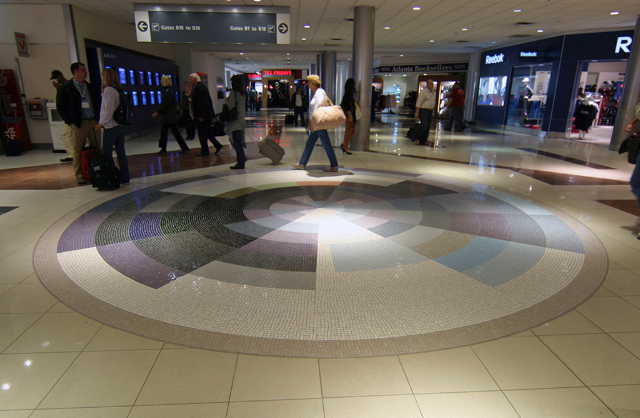 The light reflective, hand cut tiles were fabricated by Miotto Mosaics, with whom I worked closely in their studio near Venice, Italy, and on site at the airport.